Thomas Cook is running a photography competition. The rules are simple: post four photographs, each one representing the four elements of earth, air, fire and water. Click here for Competition Details. Over millennia in countries all around the world, sunlight and warm air dried the slowly flowing resin secretions from ancient trees to form a magical stone-like fossil that would later be found by humans as they wandered along lake shores and beaches. Amber nuggets come in a wide range of colours and degrees of transparency from fiery clear yellow-browns to cloudy opaques based on their internal structure, impurities such as air bubbles, insects and plant fragments, and weathering caused by air, light and changes in humidity and temperature. Since ancient times, wearing amber jewellery or holding a piece of amber in your hand has been thought to impart a sense of healing and inner peace by drawing out negative energy from the body. Amber was also burnt like incense in ancient China as it gives off a musky pinewood scent and does not melt. Numerous legends have been created over the years to explain amber’s origins. In the Baltic, for example, Lithuanian folklore claims that the queen of the sea fell in love with a fisherman but her father did not approve and punished his daughter by destroying her amber palace and turning her into sea foam. In the Mediterranean, an Ancient Greek myth tells of a boy born to a female sea spirit and the god of the sun who was adopted by the King of Ethiopia. One tragic day, the young prince drove his biological father’s chariot through the sky and ventured too close to the surface of the Earth. This caused the rivers and lakes to evaporate and scorched the vegetation, creating the Sahara desert in Africa. The prince’s sisters (who happened to be trapped inside poplar trees at the time) were so sad that they wept tears that dried up in the blazing heat and became amber. Amazingly, the first discovery of true amber in Australia occurred less than a decade ago along beaches in Far North Queensland – even though these fossils probably formed millions of years ago. 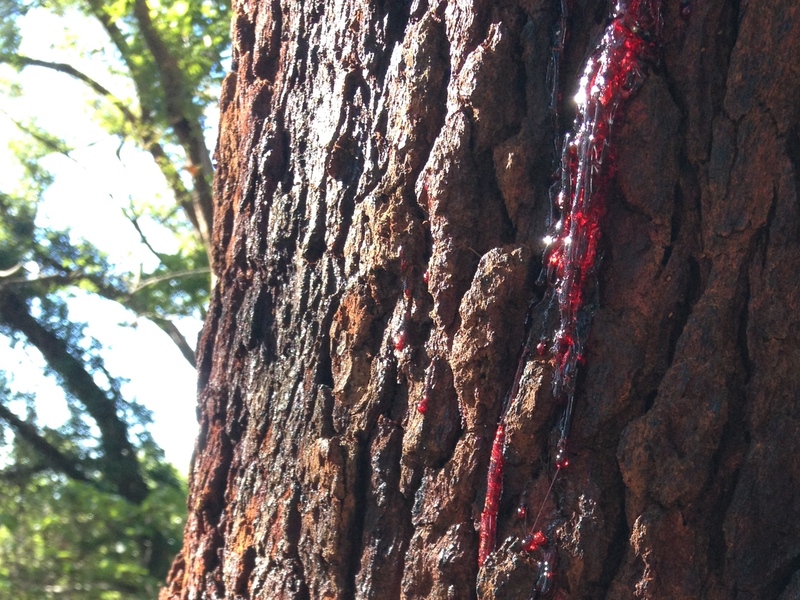 Imagine if we could find amber made from the blood red resin of the Eucalypt tree I photographed in the Gold Coast hinterland? What a great excuse for a beach holiday to Burleigh Heads! Note: I forgive The Sicilian Housewife for not nominating me or giving us more notice! GORGEOUS photo and beautiful story with it too. Thanks & good luck to you. The background to my photo is not quite so beautiful as it nearly killed me walking to the top of the mountain. Someone asked me to take a photo of this tree for them on the way down and I was happy to oblige as I desperately needed a rest!